I was a Dewalt guy for years, and have had an old nicad drill and driver for the last 10 years or so that have served me well, but after my old drill got dropped on the concrete floor and cracked, I decided to treat myself to a brushless setup. I had been wanting to go brushless for awhile and this was the excuse I needed. I pretty much settled on the Milwaukee line due to a variety of factors, including the availability of the 18/12v combo charging station. Yes, I chose my tools largely based on the charging system, but after extensive comparisons, spreadsheets, etc. I finally came to the conclusion that the “specs” pretty much had them all close enough not to matter, and that the reviews of any make or model have detractors and supporters. In short, the only real difference for me was the charging station. Before the Dewalt broke but after I knew I was going Milwaukee, I picked up the M12™ Cordless LITHIUM-ION 2-Tool Combo Kit 2497-22. I figured I wanted the smaller option(s) and the larger and having two of each is a nice convenience in the shop and in the house. I can leave the 12v versions in the garage for household chores and the 18v in the shop for real work, and go grab a spare from one place or the other when I need them. Once the Dewalt turned up cracked, I headed out to Home Depot to get the brushless 18v kit, only to find that the price I had seen a week prior had gone up by $50. I was in luck, however, in that the sticker on the display hadn’t been changed yet so they sold it to me at the old price! The inclusion of two battery sizes was something else that sold me on the Milwaukee as some of the competitors included two of the 2.0 batteries only and the Milwaukee kit comes with one 2.0 and one 4.0XC. I only have my old legacy Dewalt system to compare to at home, not other more modern brushless setups, but the new tools are a major step up for me. They are lighter, run longer look better (I know, who cares what they look like, right? ), and are just in every way a better set of tools for me. I love having the cordless hammer drill, and basically haven’t taken my old Makita hammer drill out of the case since I got the new one. I haven’t measured it, but the holes seem to stay truer to size with the new hammerdrill than with the old Makita too as Tapcons seem to stay tighter and strip out less. I love that both tools have lights, something my old tools didn’t. Specifics of each tool below. The drill/hammerdrill has three settings, one for drilling, one for hammerdrilling, and one for screws. Basically, the screw setting lets you use the clutch, the drilling setting locks out the clutch, and the hammerdrill setting locks out the clutch and adds the hammering action. I love this because I can go back and forth from drilling to driving just by changing the setting rather than spinning the clutch back and forth like I had to on my Dewalt. It’s also especially nice on Tapcons since they tend to get stripped out in CMU walls if you don’t use the clutch or if you bang away at them with an impact driver. Since my shop walls are all painted CMU this is a huge timesaver for me. Two things I don’t like about the drill are very minor. The first is that the forward/backward switch can be easy to bump at first. I seem to have trained this out of myself but for the first week or so it was getting bumped. The second is that only one belt clip came in the kit, attached to the driver, and I wish they had just included two. This thing is super compact, and super lightweight! Not really much else to say about it except that it drives like it should, and seems to run forever. Like the drill, the switch was getting bumped at first but seems to be a non-issue now. My only complaint on this one is that the “chuck” doesn’t seem to allow me to just press in on the bits to engage them like my Dewalt does. I have to pull back on the collet, insert the bit, and then release. Not a big deal, and I’m frankly not sure if this is a design feature or a flaw in my particular sample, but in either case it’s not enough of a problem for me to go through the trouble of returning it. Had I not bought the 12v system first, or if I didn’t have the need for one set of tools for the shop and one set for the garage, or if the budget was a bit tighter, I wouldn’t bother with the 12v system. Even now, I grab the 18v brushless tools every time if they are all sitting together. The reason is that the 18v are better in every way. They feel lighter in the hand, the grip is thinner and more comfortable (due to not having to house the battery), and they are virtually the same size when it comes to the head length/width. The larger battery sticking out of the bottom obviously makes it larger, but I find that dimension tends not to matter as much as the head size and the lion batteries are still more compact and lighter than the nicad that I’m used to. Thanks to your review, I now know not to go with the smaller 12 volt set. I have both the 12v and 18v Milwaukees and it surprises me that the 12v has the power to handle most of the jobs I can throw at it. In reality I could get away easily with only the 12v package if I had to. Plus, they fit my hands better than the 18v. As for the collet on the driver, every driver I had whether it was Ryobi, Makita or the Milwaukee had the same type so I wasn’t aware there was a different style like the DeWalt has. Which charger did you get? I also liked that they had the charger that can charge 3 of each type. re: the 12v vs the 18v, in my case it’s kind of an unfair comparison. I’m comparing a brushed 12v system to a brushless 18v. What I had hoped was that what the 12v brushed gave up in power it would make up for in weight nad size, but that’s simply not been the case. I have already encountered a few places where the 12v drill bogged down but the 18v powered through. 2597-22, but it’s damn near as expensive as the 18v brushless system. Thanks for the review. Just like you, I have been using Dewalt NiCad drills for the past decade. The latest being the DC970. I’m thinking of upgrading to a new brushless and have been researching for the past two weeks. Just like you mentioned – ” the “specs” pretty much had them all close enough not to matter”. 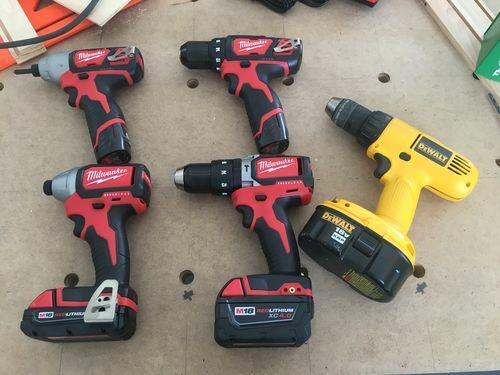 Most review sites rate the Milwaukee Fuel as the best: http://www.thediyhubby.com/cordless-drill-reviews/ , but then a trusted technology site like http://www.popularmechanics.com/ rated the Milwaukee towards the bottom of the top ten. My point is that most of the top brand drills perform equally well and it comes down to personal preference. In your case the charging system. For me it is the weight and how it feels in hand. I have decided to go with the Makita XPH 18 Volt. It is light, compact and feels great in hand – the things that matter to me.